New York City has undergone a transformation in the last few years from being unfriendly to bikes (or at least having that reputation) to implementing some of the most cutting edge bike infrastructure of any U.S. city. How did this change come about? The long-story is that the changes we’re benefiting from are the product of 40 years of work. Transportation Alternatives was founded in 1973 and has worked diligently, organizing New Yorkers to reclaim our streets from cars and to reapportion the public space to more healthy, city-friendly ways of getting around. New York City has always been a leader in transportation reform and bicycling. Safe Routes to School started here in the Bronx at the same time that advocates in Marin, CA were importing the concept from Europe. Safe Routes to School is now a federally funded program. The first dedicated bicycle path in the U.S. was built in Brooklyn in 1895—the Ocean Parkway Greenway, designed by Frederick Law Olmsted and Calvert Vaux, who also designed Central and Prospect parks and the Emerald Necklace of parks in Boston. In 2005, Transportation Alternatives launched the “New York City Streets Renaissance Campaign” with The Opening Planning Project and the Project for Public Spaces and we and changed the conversation about streets and traffic to one about livability, community, and quality of life. We used speakers, events, surveys, blogs, and media to put a face on how we move about the city. We changed the evaluation criteria for streets from traffic flow to quality of life. We moved from a transportation discussion to a social one with human emotions. Before this, we had been trying to solve the wrong problem. Traffic flow will never make people happy. Transportation Alternatives articulated and brought forward a vision that didn’t have to do with solving traffic problems. It had to do with people and their neighborhoods and how they feel. Because the old New York City Department of Transportation (and most traffic engineers the world over) was afraid of things that didn’t solve traffic problems, it weakened them politically to not be able to talk about streets and social issues and quality of life. Advocates had a few tastes of our new vision. We had the Hudson River Greenway on Manhattan’s Westside and pedestrian plazas in Herald Square. We visited Bogotá to see car-free days, Copenhagen for bike rides, London for congestion pricing, and Paris for Vélib and Paris Plâge. We talked about these things and more and more people learned how they improve quality of life and made the city better. Much of the Streets Renaissance campaign’s success was realized by the social settings and events Transportation Alternatives and our partners hosted and where like minded advocates met. They reinforced the notion that our mission is a social and emotional one, not a traffic-fixing one. Photos, videos ,and inspiring and creative graphics made these events memorable and this strengthened people’s faith and grew the movement. A lot has been captured for posterity. Transportation Alternatives’ quarterly magazine, Reclaim, is like our history book and our twice-monthly StreetBeat e-newsletter gives ongoing coverage of our work. The documentary film “Contested Streets” is a good prologue into the last six or so years of advocacy. Whatever issue you’re interested in, Streetsblog and Streetfilms have probably covered it though. They made transportation and streets a daily news beat, prompting big media like the New York Times and the Gothamist blog to regularly report on bicycling and public space. New York’s 9th Ave separated bike lane. Photo by flickr user rllayman. What sort of impact have projects like the 9th Ave separated lanes and other dedicated bike infrastructure efforts had on ridership in the city? Bottom line: the innovation of protected bike lanes in New York and other U.S. cities have catalyzed a massive increase in bicycling. And at the same time, they’ve made roads safer for everyone, whether they’re moving by bike, foot, or car. What’s simply amazing–the superpower of protected lanes–is the diverse array of people you see riding now. I think of my mom as my model bicyclist. She has a bike, she likes to ride it, and even goes for recreational rides when she’s on vacation. She’s come to New York to do Transportation Alternatives’ rides like the NYC Century Tour and the Tour de Brooklyn, but if I were to ask her to go for a ride in NYC the day before one of T.A.’s rides, she’d look at me like I’m crazy. She’s comfortable riding through the Big Apple on a large, organized ride surrounded by thousands of other bicyclists, but when she looks at the streets on an average day she sees an uninviting scene. She’s got a bike; she likes to ride; she wants to ride. What’s our responsibility to make her feel comfortable to get on her bike on a normal day? It all starts with infrastructure. As a public space, streets have to be designed to help people do what they want. The latent demand for bicycling in cities is huge, but if people look at a street and all they see is rough, rushing traffic, there’s no way they’re going to get on their bike and go for a ride. We need to build roads that give everyone safe space—this keeps them out of each other’s way and out of harm’s way. 9th Avenue is a beautiful story, but the lessons learned there go back a decade and a few blocks west to the Hudson River Greenway. The Greenway is a car-free path from Battery Park to the northern tip of Manhattan, connecting the two largest business districts in the country to some of the densest housing in the US. It’s the busiest bike path in the country because it’s safe, traffic-free bicycling for anyone interested, from 8 to 80. People need to feel protected from traffic. 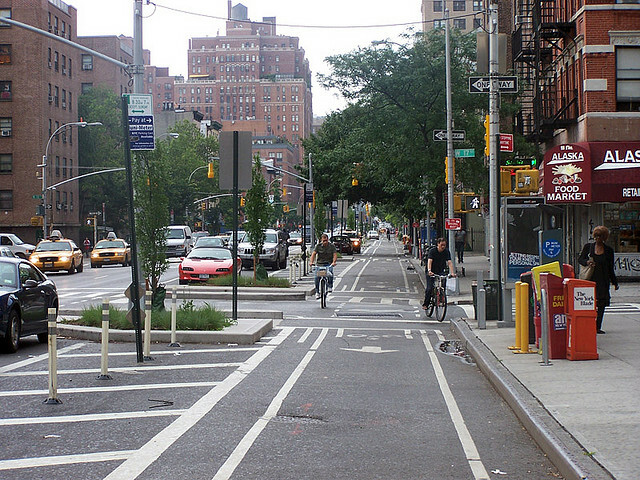 The 9th Avenue separated bike lane was the first physically protected, on-street bike lane in the US. The Hudson River Greenway and similar bike paths proved that “if you build it, people will bike.” The trick in cities is that there isn’t always space available to build off-street bike paths, so we need to be creative in carving out dedicated space for people to ride bikes. Fortunately, the past sixty years of street design has left our roads massively over-designed. There’s way more space than we need to move the cars that use them. 9th Avenue showed that cities can reapportion road space and build 21st-century streets that make bicycling safe for people of all ages and abilities. And, even if you only care about traffic flow and level of service, 9th Avenue showed that converting a car lane to a top quality bike lane won’t cause gridlock. Fortunately, public opinion research consistently shows that city dwellers prioritize providing safe transportation options much more than focusing exclusively on the movement of private autos. Since the 9th Avenue protected bike lane was installed, it’s been amazing to see planners and engineers continue to develop the designs for protected, on-street bike lanes. Whether protected from moving traffic by parking, bollards, or other physical separation, designers across the country are creating great standards that can be adapted to cities’ unique characteristics and the neighborhoods and blocks that make them special. Photo via flickr user Regional Plan Association. Despite relative success in cities such as NYC, Portland, Minneapolis, and others, bicycling only makes up about one percent of the mode share nationally. What do advocates need to do to increase the number of riders nationwide? Meet people where they’re at. Before anyone gets on a bike, they need to imagine themselves riding a bike. If its advocates’ job to promote bicycling, then how can we help people have their own vision and realize it? Of course, there’s a balance between meeting people whether they’re at and pushing the conversation with new ideas. As I mentioned above, this was the sweet spot that the New York City Streets Renaissance Campaign sought: bring the vision and present it in a social space where people feel comfortable being exposed to new ideas. The demand for bike riding is here and it’s only growing. People like routines though, so the more they’re engaged, the more they’re asked to think about getting from A to B in different ways, then the more they’re going to be able to get their heads around the “new” idea of riding their bike and give it a try. You’ve got to advocate like there’s no tomorrow for protected space and safe traffic. Protected bike lanes make people feel comfortable going for bike rides more often. Twenty miles per hour is plenty fast for urban streets. Set the speed limit there. Design roads to prevent crashes so when collisions do happen the penalty isn’t death or serious injury. Imagine a place where people of all ages and bicycling abilities can go out their front door and feel comfortable getting on their bike and going where they want to go. What does that look like? That’s what advocates should aim for and help others see that vision and aim for it too. Although it seems somewhat unlikely to pass in its current iteration, the proposed House transportation bill would deal a problematic blow to the work you and similar bike, pedestrian, and transit advocates are doing. What would happen if the bill passed? What does it say that House Republicans are pushing for these kinds of rollbacks on alt-transportation progress in America? It seems like the debate in Washington is about power, not about transportation, and that’s leaving everyone across the country in pain. It’s sad really. Bicycle and pedestrian funding is a teeny tiny part of the federal transportation bill—less than 1%. Why is the bill stuck in partisan gridlock? The reason we have a six year transportation bill is because it takes at least a few years to plan and build transportation projects. Government needs stable, multi-year funding to see projects through, whether they’re bike lanes, subways, or roads. How can you complete a project that’ll take, say, four years to plan, approve, and build if you have to apply for new funding every three months? That’s a pretty big risk for everyone involved: elected officials, government agencies, contractors, tax payers. Fortunately, we’ve got a good team of federal advocates looking out for Americans. The America Bikes Coalition, the League of American Bicyclists, and Bikes Belong are some of the top groups working on protecting federal funding for biking. Bicycle advocacy at the state and local level is very strong and getting stronger, so even in an unconscionable scenario where bicycle and pedestrian and Safe Routes to School funding is gutted in Washington, local advocates will continue to make these improvements are made. Everyone should join their local bike advocacy organization (you can look it up on the Alliance for Biking & Walking’s website). 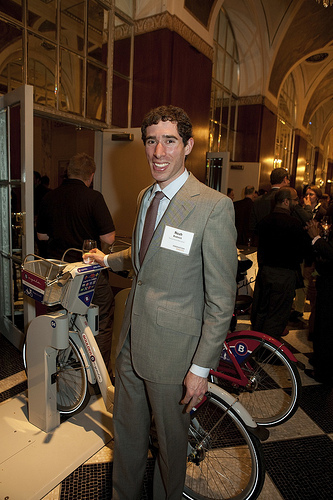 This entry was posted in Advocacy, Interviews and tagged alt transportation, bike advocacy, new york city cycling, noah budnick, nyc transit, transportation alternatives. Bookmark the permalink.